The Federal Road network of Germany contains a large number of highway structures like bridges, tunnels, retaining walls and noise reduction walls. Maintenance programs are prepared on the results of inspections which are carried out every 6 years as a visual inspection, thus implying that damages are typically only identified when the deterioration becomes visible. This indicates that there is ample demand for test methods to establish the condition of structures before heavy damage has occurred. For regular inspections, non-destructive test methods (NDT) may provide a relatively quick and inexpensive means to establish whether a structure is still in a serviceable condition or not. Results of these investigations may improve the quality of information by eliminating the subjectivity associated with current visual inspection techniques. The paper describes present application of NDT in Germany in the field of inspection and analyses of structures. This covers the application of sonic and radar devices to localise prestressing reinforcement and to detect damaged areas, electric methods to detect corrosion, magnetic methods to detect ruptures in steel elements and the use of a high speed two channel laser scanning device for inspection of road tunnels.Beside this, areas are given, where improvements in NDT methods could bring real benefit for the inspection of structures. The Federal Road network of Germany contains a total of about 36.000 bridges with a bridge deck area of about 25,6 million m2, 158 tunnels with a total length of about 116 km and a large number of other highway structures like retaining walls, noise protection walls and structures for traffic signs. The maintenance programs prepared for this purpose not only require a high budget, but also influence the traffic infrastructure and, thus, the economy and society as a whole. The present safety of the structures has to be ensured under consideration of environmental aspects. At the same time the structure owner has to make sure that the maintenance activities are carried out in the most efficient way. The programs for lasting and systematic maintenance of these structures tie up a large percentage of the budget. In 2001 about 350 Million Euro were spent for the maintenance of bridges and other engineering structures on Federal Roads. Prognoses for the future maintenance budget show that the maintenance costs will rise to about 700 Million Euro to keep the condition of the structures at the present level.This increase is influenced by insufficient durability of most of the structures which were built during the years 1960 to 1980. Further important aspects are the growing volumes of traffic and higher gross weights of trucks which lead to a reduction of the expected lifetime of bridges. Considering the fact that financial resources are restricted, the maintenance costs have to be spent in a way to obtain the greatest possible benefit. In future this task will be supported by the application of a Management System (Bridge Management System, BMS). Figure 1 shows a general outline of a BMS as presented by the OECD in 1992. Basic characteristics are that a comprehensive database is available, that analysing systems are capable of assessing the condition of bridges, to rank and prioritise bridges and measures and are capable of developing and compare alternative repair and rehabilitation strategies. The integrity of BMS is related to the quality and accuracy of bridge inventory, damage and condition data . Fig 1: BMS - Structure. Non-destructive testing (NDT) on object level is expected to gain an increasingly important role in the management of structures. Efforts should be made to integrate the NDT data into the BMS-Process. This will improve the quality of information by eliminating the subjectivity associated with current visual inspection techniques. NDTmethods can be used in future under the condition that results of investigations can be quantified and translated into rating resulting from bridge inspection. Figure 2 gives an overview on the different steps from bridge inspection to the usage of the data for Bridge Management. During bridge inspection the whole structure is inspected according to DIN 1076  and RI-EBW-PRÜF  by visual inspection to localise defects on element level. These defects are then assessed according to various attributes (e. g. stability, traffic safety and durability). On the basis of the description of the defects alternative maintenance measures can be identified, costs can be calculated and the deterioration process over the remaining service life of the structure can be estimated. These Information are the basis for the subsequent application of BMS-modules. Fig 2: Additional analyses on object level and BMS. In cases where unusual defects occur (defects where kind and extend can not be ascertained during visual inspection) additional analyses on object level are induced by the bridge inspection engineer. In the course of these detailed analyses on object level various methods can be applied, where - from the structure owner's point of view - non-destructive methods are preferred. As a result of the application of non-destructive methods the investigated defects have to be assessed by taking the existing assessment guideline RI-EBW-PRÜF into account. Furthermore on the basis of the detailed analysis of defects possible maintenance measures, costs of these measures and the expected deterioration behaviour with and without measures should be described. Beside the application in frame of inspection of structures non-destructive testing can be used to update the inventory data, e. g. material properties or geometrical data. To support a standardized application, the Federal Ministry introduced a manual for additional analyses on object level which contains a compendium of test methods . Visual testing is the most common application of NDT in the course of inspection. Also a lot of other simple NDT-methods are regularly used, e. g. Schmidt-hammer to detect concrete strength, simple hammer to detect delaminations and cover meter to detect the concrete cover. Beside this there are a lot of more sophisticated NDTmethods which are mainly used by experts in the frame of additional tests. The Federal Highway Research Institute (BASt) has performed various on site investigations on NDT-methods and their application. Based on the results some important NDTmethods and their possible fields of application are described in the following. Ground penetrating radar (GPR) is an electromagnetic wave that travels in a straight line through a dielectric material. The wave is reflected by objectives in its path. Pulses are transmitted into and received through the material to be evaluated. The electromagnetic waves pass through dielectric media. Since the waveimpedance for metals is zero, electromagnetic waves are reflected off metallic material. Measured arrival times depend on the dielectric constant of the material (e. g. in dependence of moisture and chloride content of concrete). Therefore knowledge about material velocities is necessary. Measured arrival times lead to information about subsurface anomalies and their depth. Localisation of reinforcement in concrete construction elements, bridges etc. 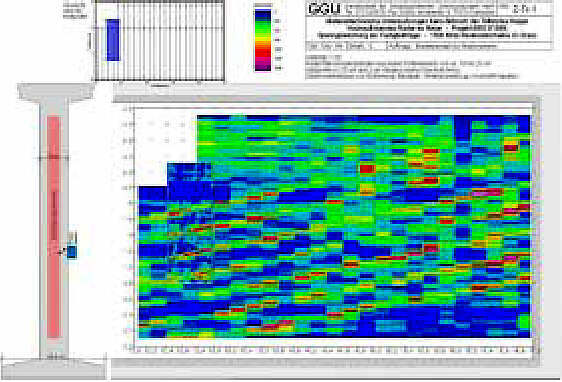 Fig 3: GPR for manual and high speed application. Fig 4: Localisation of prestressing reinforcement in concrete. Acoustic test methods encompass all forms of testing based on transmission and reflection of stress waves. They are used either to characterise the properties of materials like concrete by wave speed measurements or to locate and identify discrete objects and flaws by transmission and reflection of stress waves. Fig 5: Impact-Echo device and test results. f = 0.96 * Cp/2T (f = frequency, Cp = P-wave speed, T = thickness) of the impact-Echo Method the thickness of a structure or the location of flaws and cavities can be detected. Impact-Echo is normally used in concrete structures of thickness up to 1 meter. It has been effective for testing and detecting flaws in large surface areas of concrete,although analysis of results can be complicated by complex geometry. Fig 6: Ultrasonic device and test results. Ultrasonic devices are normally used by measuring the velocity in a solid material of a pulse generated by a piezoelectric transducer. The pulse velocity depends on the composition and maturity of the material and its elastic properties. Recommended procedures are the direct transmission method that has the transmission and receiving probes in line on opposite sides of the sample and the ultrasonic pulse echo method comparable with the impact echo but using smaller frequencies (figure 6). Defects in a concrete structure may be expected to produce signals with characteristics differing of those from an undamaged component. There are different approaches that can be considered under the heading of ultrasonic methods. One approach is to analyse the ultrasonic signal for its frequency content and use this to assess the condition of the structure. This approach works best with distinct and well characterised items. Another approach is to analyse the signal in a time-domain for its amplitude content. An common approach uses ultrasonic scanning techniques to generate images of components within the unit using pulse-echo type technology.Each approach has its drawbacks, often associated with the geometry of the inspected structure. However, the ultrasonic scanning approach appears to have the capability of providing a useful tool, though signal generation and processing techniques could usefully be improved. Corrosion of reinforcement produces a corrosion cell caused by differences in electrical potential. This difference can be detected by placing a half-cell, e.g. a coppercopper sulphate half-cell, on the surface of the concrete and measuring the potential differences between the half cell and steel reinforcement. For each type of half-cell different potentials can be measured. In practice it is assumed, that for a coppercopper sulphate half-cell and measured potentials smaller than -0,35 volts the probability that corrosion occurs is greater than 90% but universal fixed boundary limits to distinguish active and passive zones are not applicable. These tests do not indicate the rate of corrosion. There are difficulties associated with making reliable quantitative measurements. The factors influencing the half cell measurements are affected by the resistivity of the concrete and the pH of the pore solution (carbonation). It could be necessary to use a statistical analysis of measurements on an individual structure to establish areas where corrosion of reinforcement occurs. Fig 7: Potential measurement device and test results. Measurements of resistivity of concrete can provide an indication of the presence,and possible the amount, of moisture in a concrete structure and therefore evaluate the extent and rate of corrosion of reinforcement indirectly. However resistivity measurements are sensitive to the disposition of reinforcement, so assessment of the condition of a structure and the likelihood of corrosion needs to be made with careful reference to its construction. Resistivity measurements can also be performed for measuring the permeability of seal coats on concrete. A lot of different electrode configurations have been tried in practice (e. g. figure 7),and several of these have been found to have advantages over standard arrangements. Fig 8: Magnetic measurement device and test results of cracks in prestressing reinforcement. Steel elements, e. g. reinforcement in concrete, tendons, or wires in a cable are magnetised by an outside exciting magnetic field. Local disturbances of the distribution of this magnetisation due to ruptures or the reduction of the cross section causes the emanation of the magnetic leakage flux (stray field) from the member.For generation and measurement of the stray field, a probe containing the magnetisation device and the sensors is moved along the direction of the element. With this application of a magnetic method ruptures of the steel in prestressed tendons can be detected. The signals of the mild reinforcement can be suppressed by special measurement techniques and signal analysis methods. For suspension and cable stayed bridges it is a common method to detect ruptures inside cables. Fig 9: Laser scanner device and test results. Because of large areas and time consuming procedures the inspection of tunnels in a common way leads to considerable disturbances of the traffic. Therefore the use of automatic devices for the support of tunnel inspection is reasonable. By laser scanner systems high resolution visible and infrared pictures of the inner tunnel lining can be digitally recorded. A laser scanner application is shown in figure 9. The surface of the inner lining is scanned by a two channel laser which is mounted on a horizontal axis. The maximum resolution is 10.000 points/360° for the visible picture and 2.500 points/360° for the infrared picture. By the analysis of the two pictures (visible, infrared) cracks, flaws, cavities and water leakage can be detected. Detailed maps which show the location of specific results can be produced on the basis of the recorded pictures. The mandatory application of laser scanner investigations is considered by the Federal Ministry of Transport, Building and Housing. The uniform and successful application of these methods will be supported by the introduction of guidelines. Electromagnetic cover measurement to locate reinforcement prior to core drilling or ultrasonic measurements. Potential mapping in combination with resistivity tests. As a result of potential mapping, zones at risk may be indicated. Additional resistivity tests at these zones may indicate the likelihood of corrosion actually occurring. In cases, where a bituminous layer is positioned at a concrete deck, the combination of radar and magnetic flux measurements may be practical to find out areas,where reinforcement likely is corroding. Results of radar measurements show changes in dielectric properties. Magnetic flux measurements could be used to calibrate the results and by defining the cover of reinforcement. Increasing the confidence level of test results by the use of additional methods to estimate the same property, e. g. Schmidt hammer and ultrasonic test for strength prediction. Improvement of calibration accuracy by mathematical combination of results, e. g.the accuracy of strength prediction may be improved by combination with values of density. Although NDT methods have been used successfully on a variety of concrete and steel structures, there is a general lack of confidence in the techniques because there is little independent advice on their applicability, capability,accuracy and reliability. In general more than little experience is necessary for proper interpretation of test data. Generally there is a need for development of reliable interpretation procedures. As mentioned before most of the german prestressed structures were built during the years 1960 to 1980. Especially these structures are characterized by durability problems.A widespread defect are ungrouted or only partially grouted ducts which may lead to corrosion and ruptures of the prestressing steel. Although research activities are performed on this topic, the reliable detection by NDT is still not possible. Because of time consuming procedures, the application of NDT methods in the course of inspection leads to considerable disturbances of the traffic. In most cases it has to be done at night or during the weekend which leads to enormous work loads of the inspection team. Therefore automatic and scanning NDT-devices are needed not only for tunnels but also for bridge decks. Radar has significant potential for development for signal and image processing to improve resolution around and immediately beyond the first reinforcement. This can be expected to achieve a capability to detect and locate further reinforcement and to resolve gaps. Research efforts should be concentrated on the real-time data processing.The development of specialist antennas for specific applications is useful, e.g. antennas with variable frequency. There is a lack of a consistent physical approach that links the GPR measurements to mechanical deterioration. Beside this, aspects that are also likely to have potential for development include assessing the degree of corrosion of reinforcement in concrete and detection of excess of chloride.But there is a need to assess the influence of concrete electric and dielectric properties (affected by moisture and chloride content). Ultrasonic testing appears to have the capability of providing a useful tool, though signal generation and processing techniques could usefully be improved. The availability of increasingly powerful personal computers has led to a developing interest in the use of ultrasonic tomography. More sophisticated processing techniques may also be applied to standard ultrasonic signal data sets to improve resolution and sensitivity to defects. Multiprobe ultrasonic transmission and reception should be developed to interrogate to greater depth and below reinforcing. There is still need to improve methods of attachment or coupling of the transducers. Impact Echo is a practical tool for detecting near surface voids and delaminations. Spectral analysis of surface waves can give information on quality of layered systems.Nevertheless there is a need for improved quantification of capabilities for measuring thickness, mapping or sizing layers of reinforcement, detecting and mapping of delaminations and cracks parallel to the surface especially for application with reinforcement congestion. Experimental studies should be complemented by reference data and systematic documentation of application on specific types of problems.Scanning procedures and multi-array sensors should be developed. Magnetic Flux measurement has a significant potential for detecting ruptures of the steel in prestressed tendons. Nevertheless there is a need for improved quantification of capabilities, especially for different magnetic sensors, e. g. hall sensors and SQUID sensor. Additionally there is a need to improve methods for the separation of the signals of the non prestressed reinforcement from the signals of ruptures. To ensure a uniform application of non-destructive testing guidelines are required. These guidelines should contain regulations about the execution of measurements,the analysis and interpretation of results as well as the limitations of NDT methods.Additionally, advice on the useful combination of NDT methods and for the translation of investigated defects into the condition rating used in bridge inspection should be given. The Federal Road network of Germany contains a large number of highway structures.Maintenance programs are prepared on the results of inspections which are carried out every 6 years as a visual inspection, thus implying that damages are typically only identified when the deterioration becomes visible. This indicates that there is ample demand for test methods to establish the condition of structures before heavy damage has occurred. For regular inspections NDT-methods may provide a relatively quick and inexpensive means to establish whether a structure is still in a serviceable condition or not. The results of these investigations may improve the quality of information by eliminating the subjectivity associated with current visual inspection techniques. Each NDT-method has its special field of application. Improvements as described above could bring real benefit for the inspection of structures. To ensure a uniform application and to promote NDT guidelines are required. Additionally, advice on the useful combination of NDT methods and for the translation of investigated defects into the condition rating used in bridge inspection should be given.